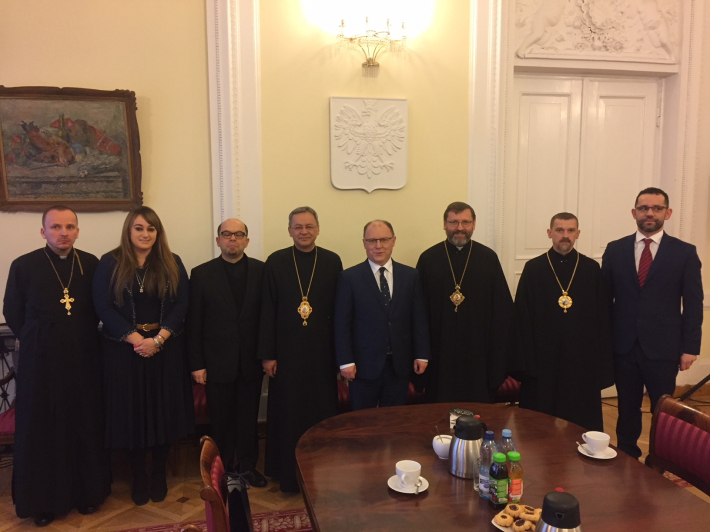 On March 15, 2018, in the framework of his visit to Poland, His Beatitude Sviatoslav, the Head of the UGCC, met with Mr. Zdzislaw Sipiera, the Mazowiecki Voivod, and Mr. Witold Pakhlo, Mayor of Warsaw. The Head of the UGCC presented to both leaders the pastoral needs of the Ukrainians who came to work in Poland. During the meeting, it was stated that Ukrainians contribute to the common good of the Polish state and thus contribute to its development. Therefore, Ukrainian workers have the right to maintain their identity and faith, that is, to integrate into a society in which they live and work, and should not be assimilated. Both of the statesmen assured the Head of the UGCC that they will make every effort to provide the Greek Catholic Church in Poland with the opportunity to have its own places to pray and cultivate its own identity in the faithful. The meetings were attended by Bishop Eugene (Popovich), Archbishop and Metropolitan of Przemysl-Warsaw, Bishop Volodymyr (Yuschak), Eparch of Wroclaw-Gdansk, Bishop Theodore (Martyniuk), Auxhiliary Bishop of the Ternopil-Zboriv Archeparchy, Fr. Stephan Batruh, Eparch of the parish of the Nativity of the Blessed Virgin Mary in Lublin, and Fr. Bogdan Kruba, a priest of the parish of blessed martyr Mykolaj in Warsaw.